I read this book over christmas and have been wanting to write a rough review of it ever since but kept pushing the post back and putting it off. If I don't write it now though I'm going to have to read the book again to remember what I want to say! I don't feel eloquent enough to write a book review, it's something I always struggled with in my English A-Level and was one of the reasons I didn't pursue an English Literature degree even though I wanted too as I love writing. I would love to write my own book one day and have been toying with the idea for quite some time to just sit down and start typing. I started writing a book many years ago (okay, no, I didn't, but I did map out the entire plot and write very detailed character bio's) but lost the book I was writing it in, typical. Anyway! 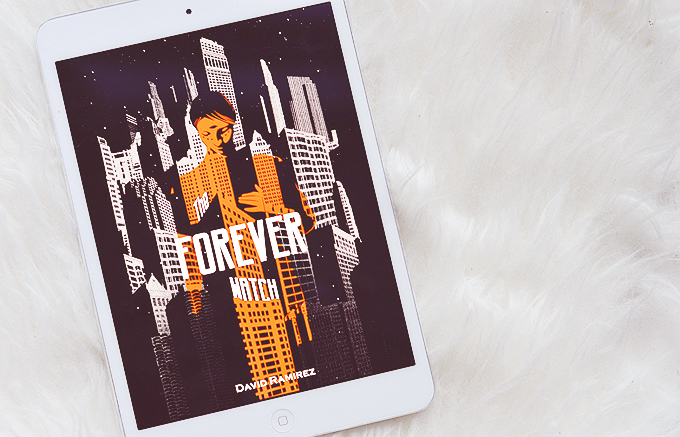 About The Forever Watch by David Ramirez. First up this is a science fiction novel, which I know will put a lot of people off straight away, but hey, it's what I like. "The Noah: a city-sized ship, half-way through an eight-hundred-year voyage to another planet. In a world where deeds, and even thoughts, cannot be kept secret, a man is murdered; his body so ruined that his identity must be established from DNA evidence. Within hours, all trace of the crime is swept away, hidden as though it never happened. Hana Dempsey, a mid-level bureaucrat genetically modified to use the Noah's telepathic internet, begins to investigate. Her search for the truth will uncover the impossible: a serial killer who has been operating on board for a lifetime... if not longer. And behind the killer lies a conspiracy centuries in the making." After reading the first chapter of this book I was extremely intrigued by the premise, earth is gone and the humans left on the ship don't seem human anymore with all sorts of powers, telekinesis, strength, speed, telepathy and more. We meet Hana having just gone through her "breeding duty" 9 months of being asleep to never see her child, obviously she doesn't take this very well and is all too keen to help a friend out when something suspicious happens. Crime is practically non-existent on the Noah so when this gruesome murder is swept under the rug they know something is wrong. I literally cannot say anything more without giving the whole book away, there's certainly quite a few things I did not expect when things get a little crazy but I thought the ending was nicely done. One thing I didn't like - and I notice reading reviews others didn't either - is the amount of technical computer coding jargon, it's ridiculous and impossible to understand. Hana codes a program which is pivotal to the plot, but at times I found myself skim-reading over paragraphs where they were talking about code just to get on with the story. It wasn't enough to ruin the book for me, I thought the plot was interesting and I haven't read (or seen a movie) with anything like it before.